ANGRAU Agricultural Engineering Entrance Test(AGRIENGGCET) results 2018/ Provisionally selected list of AGRIENGGCET 2018 candidates for admission into B.Tech. (Ag. Engg)/ Merit List of Candidates - AGRIENGGCET-2018 - Polytechnics: Acharya N.G. 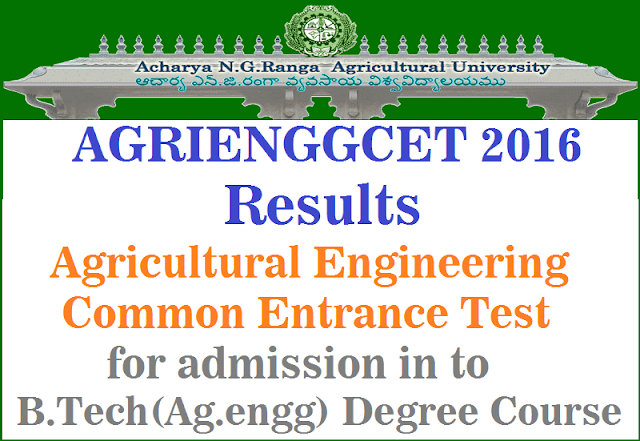 Ranga Agricultural University, AP has published the Agricultural Engineering Entrance Test(AGRIENGGCET) 2018 notification on in May, 2018 and ANGRAU had invited the application forms from the Diploma holders in Agricultural Engineering for admission into 2nd year of four years B.Tech.(Ag.Engg.) Degree Programme through AGRIENGGCET 2018 for the academic year 2018 -2019. FOR ADMISSION INTO SECOND YEAR B.TECH. ( AGRIL ENGG) FOR 2018-18: The following candidates are provisionally selected for admission into Second year B.Tech. (Agricultural Engineering) based on the AGRIENGGCET 2018 ranks. They are required to report to the Associate Dean of concerned college on ..............2018 and latest by ...............2018 failing which their admission shall stand cancelled. Note: The provisional admission for the above candidates is subject to the production of all original required certificates / social status (caste) certificate by the candidate in the college after getting it cleared from the Departments of Backward Classes / Social Welfare / Tribal Welfare within 15 days of joining the college. The candidate failing to produce the same within the prescribed time, his or her admission shall be treated as cancelled. The candidates who are granted admission shall pay the prescribed fee at the time of joining the college and hostel.Note: The provisional admission for the above candidates is subject to the production of all original required certificates / social status (caste) certificate by the candidate in the college after getting it cleared from the Departments of Backward Classes / Social Welfare / Tribal Welfare within 15 days of joining the college. The candidate failing to produce the same within the prescribed time, his or her admission shall be treated as cancelled. The candidates who are granted admission shall pay the prescribed fee at the time of joining the college and hostel. 3) SSC or equivalent certificate, showing the evidence of the Date of Birth. 4) In case of the candidates belonging to Backward Classes, Scheduled Castes and Scheduled Tribes, latest certified copy of the Social Status Certificate issued by the competent authority. 5) Xerox copies of Bonafide / Study Certificates from 6th to 10th Class and Diploma in Agricultural Engineering. Note: Such of the students who are having a break in the years of study for reasons other than failure or those who passed the qualifying examination by private study have to submit this certificate issued by the Mandal Revenue Officer / Tahsildar. In case, the students have resided in more than one place, separate certificate from the Mandal Revenue Officer / Tahsildar, should be furnished for such places of residence. Fee: The particulars of fees in respect admission into Second year B.Tech. (Agricultural Engineering). The candidates who are granted admission shall pay the prescribed fee at the time of joining the college and hostel.